Domínguez, Jorge I., Rafael Fernández de Castro, Contemporary U.S.-Latin American Relations: Cooperation or Conflict in the 21st Century? Drawing on the research and experience of fifteen internationally recognized Latin America scholars, this insightful text presents an overview of inter-American relations during the first decade of the twenty-first century. This unique collection identifies broad changes in the international system that have had significant affects in the Western Hemisphere, including issues of politics and economics, the securitization of U.S. foreign policy, balancing U.S. primacy, the wider impact of the world beyond the Americas, especially the rise of China, and the complexities of relationships between neighbors. Contemporary U.S.-Latin American Relations focuses on the near-neighbors of the United States—Mexico, Cuba, the Caribbean and Central America—as well as the larger countries of South America—including Argentina, Brazil, Chile, Colombia, Peru, and Venezuela. 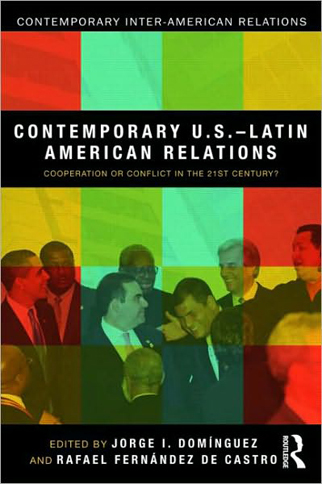 Each chapter addresses a country’s relations with the United States, and each considers themes that are unique to that country’s bilateral relations as well as those themes that are more general to the relations of Latin America as a whole. This cohesive and accessible volume is required reading for Latin American politics students and scholars alike. Domínguez, Jorge I., Rafael Fernández de Castro. Contemporary U.S.-Latin American Relations: Cooperation or Conflict in the 21st Century?. Routledge, 2010.